Healthy Smiles - Pediatric Dentist in Montgomery, AL. If you are pregnant or planning to become pregnant, you can start taking steps to establish good oral health for you and your child. It is important to have a dental checkup to make sure your teeth and gums are healthy. The bacteria in your mouth can affect your unborn child. And once your child is born, the bacteria that cause cavities and gum disease can be passed from you to your child. Start developing a healthy smile early by scheduling a complementary consult with Bush Pediatric Dentistry. Typically babies are born without teeth. It is important to start keeping the mouth healthy, even before they have teeth, by gently wiping your baby’s gums after feeding. 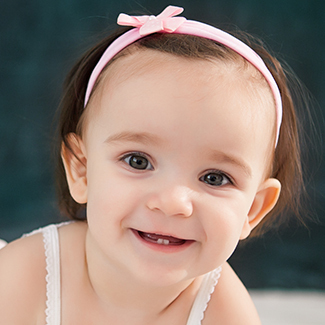 Most of your child’s teeth will come in between the ages of 6 months and 2 years. Start brushing the teeth as soon as they start coming in by using a “smear” of fluoridated toothpaste. NEVER put your child to bed with a bottle or a sippy cup, as this habit can lead to severe cavities very rapidly. During this time, transition your child from a sippy cup to use of a cup without a lid or straw. Most children have all of their baby teeth by the age of three. We recommend using a “pea-sized” amount of fluoridated toothpaste 2 times per day, especially before bed. If your child likes to brush, allow them to brush and then brush behind them. Juice should be limited to 4-6 ounces per day. Remember juice just once, milk with meals, and water whenever helps establish healthy habits that lead to a healthy smile. During this time it’s also important to help your child discontinue the use of a pacifier and stop a thumb/finger-sucking habit. Stopping these habits at this age will help limit any affects to the teeth. Permanent teeth start coming into the mouth between 5 and 6 years of age. To protect the permanent molars in the very back, we recommend dental sealants. Your child may want to brush his or her teeth on their own; however, it is important that you continue to brush after your child once a day to make sure the teeth are properly cleaned. Also, children this age often become more active in sports, which can lead to dental injuries. Mouth guards should be worn to protect the teeth during sporting activities. Ask team members about having a custom mouth guard made. Most kids lose all of their baby teeth and have all of their permanent teeth around 11 to 12 years of age. Typically, adolescence is a time of increasing independence, which can lead to more cavities due to lack of interest in oral hygiene and poor diet choices like soda, junk foods, and candy. During this time we will help empower your child to take care of his or her teeth by teaching them proper oral hygiene and making recommendations in diet. Also, we will be evaluating your child for any current or future orthodontic needs. We recommend brushing 2 times per day, once in the morning and once at night. Nighttime brushing is the most important because it cleans off all the food and drink consumed during the day and adds a protective layer of fluoride. Start cleaning your child’s mouth before they have teeth by wiping the gums with a soft washcloth or cotton swab. Once your child has teeth, even the first two, start brushing the teeth using a ‘smear’ of fluoridated toothpaste on a soft-bristled children’s toothbrush. Once your child’s teeth start touching, start flossing. Never put your baby to bed with a bottle or sippy cup. Only put formulas, breast milk or water in infant bottles. Limit juice and sugary drinks to ONE 4-6 ounce glass per day. It is best to give juice or sugary drinks in an open cup with meals. Remember juice just once, milk with meals, and water whenever. Limit sugary snacks to mealtime and eat healthier snacks between meals (e.g. nuts, vegetables, cheese, hummus). It is important to remember that sports drinks, like Gatorade, contain large amounts of sugar and acid and can cause cavities; it is best to limit these types of drinks to sporting practices and games. Pediatric dentists are specifically trained to treat the dental needs of individuals with special needs. Preparation and prevention are key to treating patients with special needs. When you schedule your first appointment, let the front office know that you have a child with special needs, and inform them of any special concerns you may have. This will allow the office to make any special scheduling arrangements, if necessary, and to prepare you better for your visit. Make sure you share with the dentist any medications or special diets your child may have so that he can discuss any affects these may have on your child’s teeth.